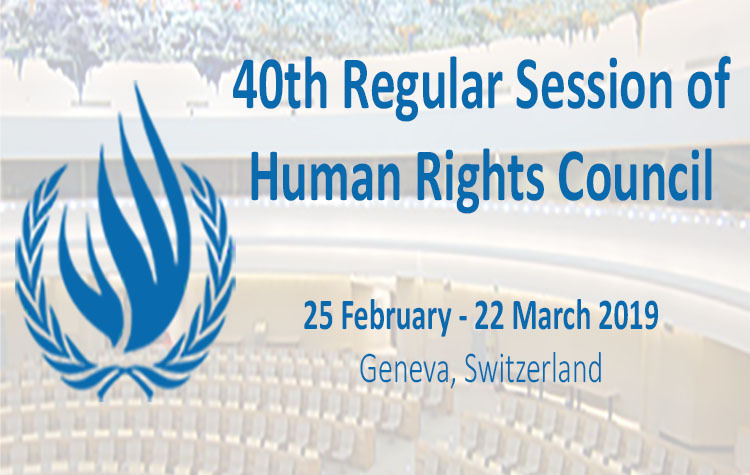 The 37th regular session of the UN Human Rights Council took place from 26 February to 23 March 2018. Over the four-week session, FORUM-ASIA delivered twelve oral statements and organised six side events. Its advocacy focused on Burma/Myanmar and Sri Lanka (which were on the Council’s agenda) as well as on Bangladesh, Cambodia, Malaysia, the Maldives, and the Philippines (which were not on the Council’s agenda) on which it called for increased attention. It also participated in the UPR outcomes of Pakistan, the Republic of Korea, and Sri Lanka, as well as on discussions on the theme of human rights defenders. FORUM-ASIA has been calling for increased attention on Bangladesh at the Human Rights Council. 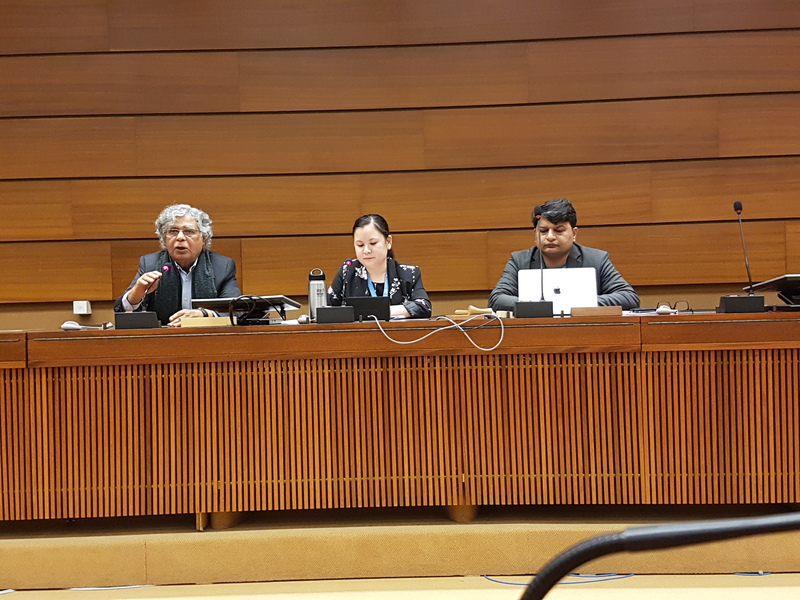 During the general debate on human rights situations that require the Council’s attention, FORUM-ASIA expressed concern over enforced and involuntary disappearance in Bangladesh ahead of elections this year. In 2017 alone, 60 cases of abduction and disappearances, most of which involve political opponents and dissidents, were reported. Furthermore, the Digital Security Act 2018, once adopted, would add measures that would muzzle free speech and impede independent journalism. FORUM-ASIA called on the government of Bangladesh to take urgent steps to curb violations and work towards an environment conducive for free and fair elections. As follow up to its advocacy on Burma/Myanmar in 2017 on the creation of the Independent International Fact-finding Mission on Myanmar and calling for a special session on Myanmar at the Human Rights Council, FORUM-ASIA called for strengthening of UN mechanisms toward a follow-up accountability mechanism. FORUM-ASIA asked the High Commissioner for Human Rights for his thoughts on this Council’s role in justice and accountability in Burma/Myanmar – beyond the International Fact Finding Mission on Myanmar’s final report in September. In his response the High Commissioner stressed the importance for the Council to recommend the establishment of an independent accountability mechanism – including a UN mechanism to collect and document evidence for prosecution. The Special Rapporteur on the situation of human rights in Myanmar presented her report to the Council, while the Independent International Fact-finding Mission on Myanmar delivered its update. FORUM-ASIA participated in the ensuing interactive dialogue, and stressed the need for the UN response to the crisis in Myanmar in a coordinated manner in Geneva and New York. FORUM-ASIA also organised a side event with the participation of the Special Rapporteur and the Fact-Finding Mission. A resolution on Burma/Myanmar, which would strengthen existing UN human rights mechanisms on the country, was adopted. The resolution requests the UN Secretary-General to allocate the necessary resources to ensure that evidence on human rights violations collected by the Independent International Fact-finding Mission on Myanmar is ‘fully documented, verified, consolidated and preserved in order for the material to be effectively shared, accessed and used by credible justice mechanisms.’ This would allow the Fact-Finding Mission to receive additional funds to complete its documentation and help preserve collected evidence for follow-up accountability initiatives. The resolution also extended the mandate of the UN Special Rapporteur on the situation of human rights in Myanmar for an additional year. FORUM-ASIA issued a press release on the resolution, stating that while the resolution is a positive development, more needs to be done to ensure accountability on a situation that bears the hallmarks of genocide. FORUM-ASIA also drew attention to the situation in Burma/Myanmar in several dialogues throughout the session, including in the interactive dialogue with the Special Rapporteur on freedom of religion or belief; general debate on human rights bodies and mechanisms; and joint civil society end-of-session statement. Throughout the course of the session, 25 states included Burma/Myanmar in their statements in various general debates, with an additional 31 states taking the floor specifically during the dedicated interactive dialogue on the country. FORUM-ASIA called for increased monitoring of civil and political rights in Cambodia, which would impact the credibility of its general election in July 2018. FORUM-ASIA raised concerns on Cambodia during the interactive dialogue with the High Commissioner, asking for his views on what the Council could do if there is no improvement in the situation between this Council session and the June session – which falls ahead of national elections in the country. The High Commissioner responded that an inter-sessional dialogue on the country was merited. FORUM-ASIA used this response to successfully advocate for its inclusion in the joint statement by states. 45 states supported a joint statement on Cambodia calling for an inter-sessional briefing on Cambodia ahead of the June session and the July national elections in Cambodia. The States expressed concern over ‘the serious decline of civil and political rights in Cambodia’ ahead of the general election to be held on 29 July 2018, including: the crackdown on non-governmental organisations (NGOs) and independent media; the arbitrary detention of opposition leader Kem Sokha since 03 September 2017; and the Supreme Court’s dissolution of the Cambodia National Rescue Party on 16 November 2017. The statement reflected several points advocated for my FORUM-ASIA including repressive laws and the call for an inter-sessional briefing, FORUM-ASIA issued a press release on the joint statement. Cambodia was also discussed in the context of the presentation of the UN Secretary-General’s report on the OHCHR’s work in Cambodia, in which the Deputy High Commissioner urged ‘the Government to take action to reverse the recent serious deterioration in the status of political rights and fundamental freedoms.’ In the general debate that followed, FORUM-ASIA delivered a statement on behalf of four NGOs, sharing the Secretary-General’s concerns on the curtailment of civic space in Cambodia. Mirroring restrictions on civil society space in the country, the Cambodian delegation interrupted FORUM-ASIA and two other NGO statements through unwarranted points of order during the debate. These events were covered in Cambodian media. FORUM-ASIA also raised concerns on Cambodia during the interactive dialogue with the Special Rapporteur on the situation of human rights defenders; general debate on human rights situations that require the Council’s attention; general debate on human rights bodies and mechanisms; and joint civil society end-of-session statement. Apart from the joint statement on Cambodia, the EU and 11 other states expressed concerns on Cambodia in their respective national capacities during the session. FORUM-ASIA expressed concern over Malaysia’s systematic restrictions on freedom of expression, assembly and association ahead of upcoming general elections, including plans for new legislation to curb ‘fake news’ despite serious concerns from civil society and the media. This would be in addition to existing laws, including the Sedition Act, Communication and Multimedia Act, Printing Presses and Publication Act and the Penal Code, which are regularly invoked against human rights defenders, journalists and opposition activists. FORUM-ASIA also drew attention to restrictions to fundamental freedoms and attacks on human rights defenders in several ASEAN states during the general debate on human rights bodies and mechanisms. FORUM-ASIA called for a joint statement on the Maldives in response to the state of emergency in place, which undermined the rule of law. Over 40 states supported a joint statement on the Maldives, which expressed grave concern over the significant deterioration of the human rights situation in the country, which the High Commissioner had described as ‘an all-out assault on democracy’. The states enumerated human rights violations under the state of emergency, including the suspension of the ‘rights of peaceful assembly, privacy, and freedom from unlawful arrest and detention,’ as well as threats to the independence of the judiciary, and the continuation of threats against ‘political opponents, journalists, civil society activists and human rights defenders.’ FORUM-ASIA was the main advocate on Maldives among civil society groups in Geneva and a number of its advocacy pints were reflected in the joint statement. FORUM-ASIA issued a press release on this statement. The number of states supporting this statement is an increase from the 34 states that previously supported a statement on the Maldives at the June 2017 session of the Council. During the same interactive dialogue, FORUM-ASIA asked the High Commissioner about how outcomes from the impending mission of his office to the Maldives could assist the Council in identifying further action – in the absence of significant change before its June session. The High Commissioner reiterated that he is concerned about the situation in the country, including plans to lift the moratorium on the death penalty, and that his office will continue to monitor the situation. FORUM-ASIA raised concerns that the state of emergency in the Maldives has seriously undermined prospects for a free and fair election later in 2018, particularly at the general debate on human rights situations that require the Council’s attention. It also mentioned the Maldives during the interactive dialogue with the Special Rapporteur on the situation of human rights defenders; interactive dialogue with the Special Rapporteur on the right to freedom of religion or belief. During the session, the EU, Germany, United Kingdom, and United States also included the Maldives in their respective national statements. The adoption of the report of the Universal Periodic Review of Pakistan, which was reviewed in November 2017, took place this session. Pakistan accepted 168 out of the 289 recommendations it received during the review. FORUM-ASIA delivered a statement regretting that Pakistan merely noted a recommendation to protect online freedom, as well as crucial recommendations on investigating attacks on journalists and human rights defenders, and implementing concrete measures to protect journalists and human rights defenders. 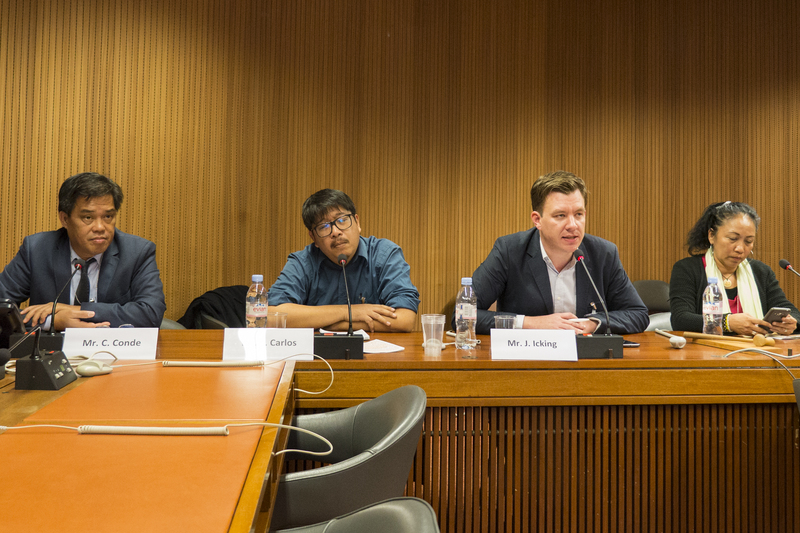 In the context of the UPR, FORUM-ASIA organised a side event on human rights and freedom of expression in Pakistan. Earlier in the session, FORUM-ASIA expressed concerns that individuals accused of blasphemy charges in Pakistan face custodial torture and are often denied a fair trial, and mentioned the case of the disappearance of a peace activist. It also shared the High Commissioner’s concerns on Pakistan, including on ‘violence against journalists and other independent voices’, during the interactive dialogue with the High Commissioner. Germany also included Pakistan in its statement during the same interactive dialogue. In his annual report, the High Commissioner deplored the Philippine President’s statement to police not to cooperate when it comes to human rights and further vilification of the Special Rapporteur on extrajudicial executions. He expressed further concern on deepening repression in the country, including threats against human rights defenders and journalists. FORUM-ASIA echoed the High Commissioner’s concerns during the interactive dialogue that followed, and also delivered a statement on ASEAN’s failure to meaningfully respond to extrajudicial killings in the Philippines’ ‘war on drugs’. FORUM-ASIA and six international organisations supported a joint civil society statement on the Philippines, calling on the Human Rights Council to hold the Philippines accountable to standards expected of its members, and urging the Council to establish an international, independent investigation into the ‘war on drugs’. FORUM-ASIA called for continued attention on the Philippines this session. States that expressed concerns on the Philippines include Australia, Czech Republic, Finland, Germany, Iceland, Liechtenstein, and United Kingdom, as well as the European Union. FORUM-ASIA organised a side event on human rights in the Philippines, and also included a Filipino speaker in its side event on human rights defenders in Asia. The adoption of the report of the Universal Periodic Review of the Republic of Korea, which was reviewed in November 2017, took place this session. The Republic of Korea accepted 121 out of the 218 recommendations that it received during the review. 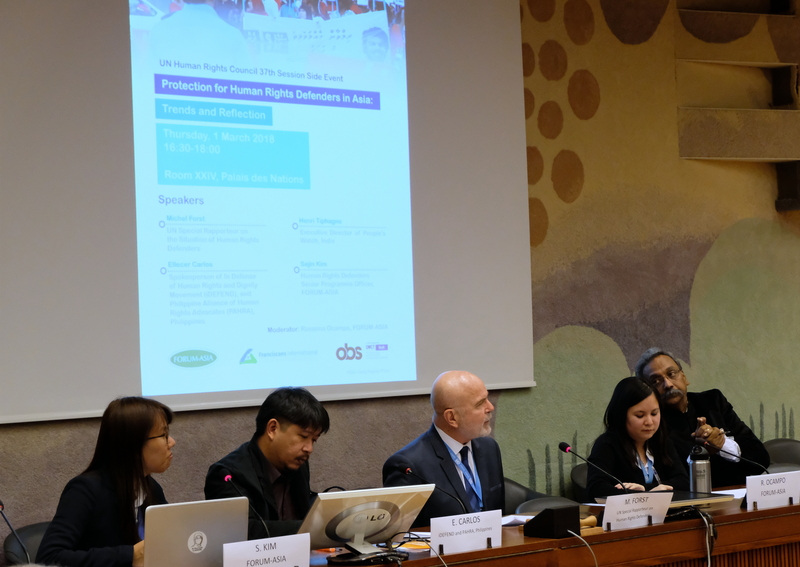 Together with the South Korean NGO coalition for the 3rd cycle of the UPR, FORUM-ASIA delivered a statement acknowledging the government’s efforts in engaging with civil society in the UPR process but regretting that some of civil society’s key concerns were ignored. The government did not accept recommendations to abolish the death penalty and the National Security Law; to adopt a comprehensive anti-discrimination law, which also addresses discrimination based on sexual orientation and gender identity; and to allow civilian alternative service for conscientious objectors to military service. FORUM-ASIA welcomed the government’s support for recommendations on freedom of expression, and freedom of assembly and peaceful association, including to ratify four ILO core conventions, as well as the government’s commitment to protect human rights defenders, and to investigate excessive use of state force against defenders and trade union representatives. On behalf of civil society in the Republic of Korea, FORUM-ASIA called upon the government to develop a concrete and time-bound implementation plan in consultation with the National Human Rights Commission and civil society organisations. The OHCHR presented a report on promoting reconciliation, accountability and human rights in Sri Lanka, which expressed regret in the slow progress in establishing transitional justice mechanisms, and the lack of willingness or capacity of the government to address impunity for gross violations of international law. The Deputy High Commissioner added that there has recently been an increase in incidents of attacks and hate speech against minorities. FORUM-ASIA shared similar concerns in the general debate that followed, and endorsed the High Commissioner’s call for the application of universal jurisdiction. It further stated that it is imperative for the Council to intensify its scrutiny of Sri Lanka beyond March 2019. It had asked states to continue to pay attention to Sri Lanka and hold the government accountable to its commitments under resolution 30/1. During the general debate, the main sponsors of HRC resolutions 30/1 and 34/1, particularly Macedonia, Montenegro, the U.S., and the UK, delivered a joint statement. Other states that spoke on Sri Lanka were Bulgaria on behalf of the EU, Germany, Switzerland, Australia, Georgia, Belgium, Norway, Canada, Denmark, Ireland, and the Netherlands. The High Commissioner had also spoken about Sri Lanka in his annual report to the Council, wherein he presented his global update of human rights concerns. The High Commissioner expressed his regret in the absence of meaningful progress on the transitional justice agenda, and encouraged member states to explore the use of universal jurisdiction in the absence of such progress. In the interactive dialogue that followed, FORUM-ASIA asked the High Commissioner to elaborate further on what this Council and the UN can do beyond his final report on the country in March 2019 – if meaningful progress continues to be lacking. The High Commissioner responded that he will closely monitor developments in the country and will continue to express concerns both privately and publicly, particularly in relation to impunity. Sri Lanka was also discussed in the context of the adoption of its UPR report. The government accepted 177 out of the 232 recommendations that it received. FORUM-ASIA delivered a statement expressing concern that the government has refused recommendations, including to repeal the draconian Prevention of Terrorism Act, which has often been used arbitrarily against human rights defenders, civil society and journalists. Furthermore, the government has rejected recommendations to develop a clear timeline and benchmarks to accelerate the implementation of its commitments under resolution 30/1 – despite serious concerns about the lack of meaningful progress in transitional justice. 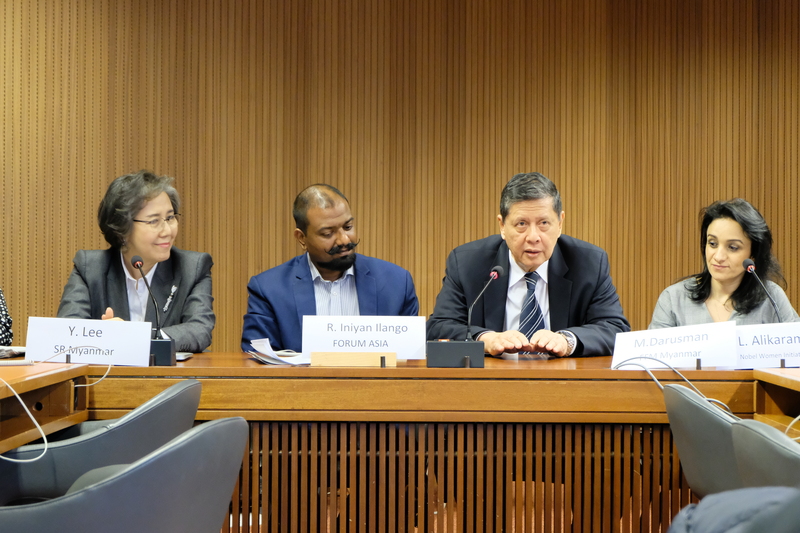 In this regard, FORUM-ASIA co-sponsored a side event on transitional justice in Sri Lanka, asking the question of it would deliver justice for victims of enforced disappearances. The Special Rapporteur on the situation of human rights defenders presented his thematic report on defenders of people on the move, and mentioned the recent loss of human rights defenders in 2017, including defenders from the Maldives and the Philippines. 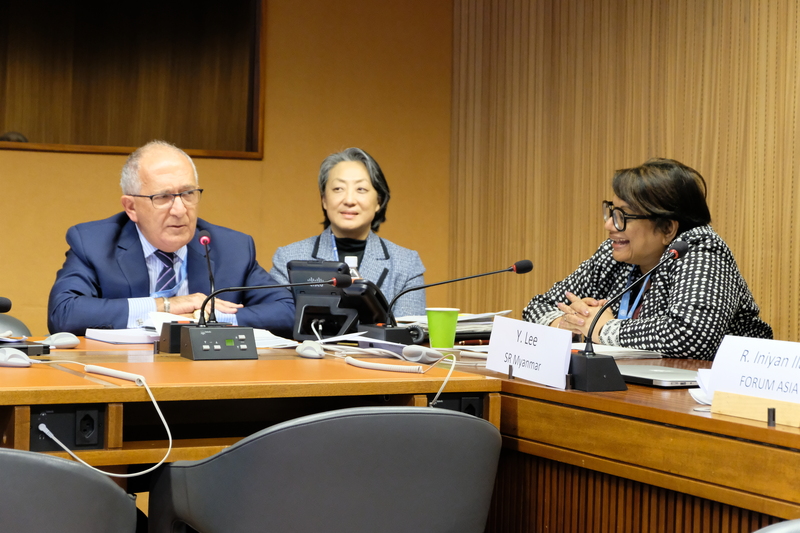 In the interactive dialogue that followed, FORUM-ASIA noted the Special Rapporteur’s concerns on safeguarding the rights of those defending people on the move – particularly those displaced due to violations of their rights. FORUM-ASIA further expressed concerns about systematic harassment against human rights defenders in Asia, including in Cambodia, the Maldives, Pakistan, and Thailand. 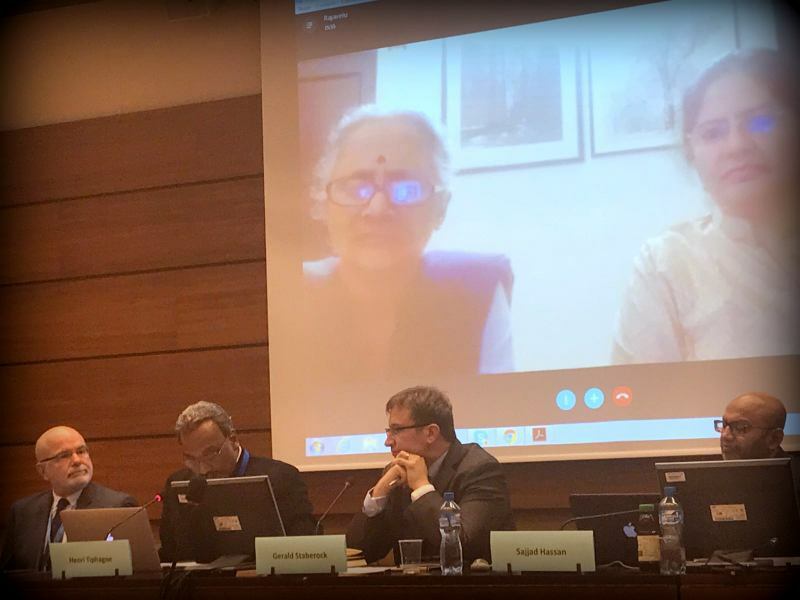 FORUM-ASIA organised a side event with the Special Rapporteur, as well as speakers from India and the Philippines. In this side event, FORUM-ASIA presented regional trends of threats against human rights defenders, and examples from Cambodia and the Maldives. It also co-sponsored a side event on shrinking democratic space in India. FORUM-ASIA also raised concerns on attacks on human rights defenders in several ASEAN states, and particular cases of threats against defenders in Cambodia and Malaysia, during the session. The joint civil society statement at the end of the session that FORUM-ASIA supported emphasised that the Council must protect human rights defenders on the ground and involve them in its work, including on strengthening the Council.